The Narre Warren North fires were mostly along the creek area, before spreading out when it reached King Road. A family of six living in John Joseph Court, Narre Warren North witnessed homes surrounding theirs destroyed by the Black Saturday fires in 2009. On the morning of the fires, homeowner Claire sent her two children to a friend’s house for a swim, further down Crawley Road. The children remained there after the fire broke out, with the other parents for safety. “I remember it was hot, really hot. It hit 47 degrees Celsius in Narre Warren North,” Claire said. “We closed up the house, the cooler was on and the children went for their swim. When Claire’s partner Steve went to investigate, he didn’t come back. “So I went to find him and saw just how bad it was,” she said. 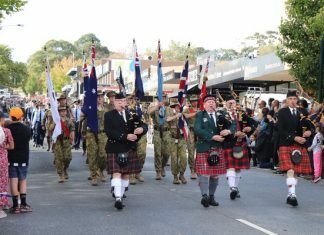 “He, along with dozens of other local men, were helping the CFA fight the fires with hoses and buckets. It was bedlam. Steve said families were standing on their properties, looking lost and not knowing what to do. “They and their houses were at risk but they were just watching. Strange,” Claire said. “I’ll never forget seeing a large gum tree just spontaneously combust ahead of the fire. Claire said Steve loves helping people and he “didn’t hesitate to get out there and be proactive”. “I was worried about him of course, but I also knew he’d keep himself safe and hopefully not do anything stupid,” she said. Claire watched as Elvis, a water bombing helicopter, arrived and dumped water from a local lake around her property. 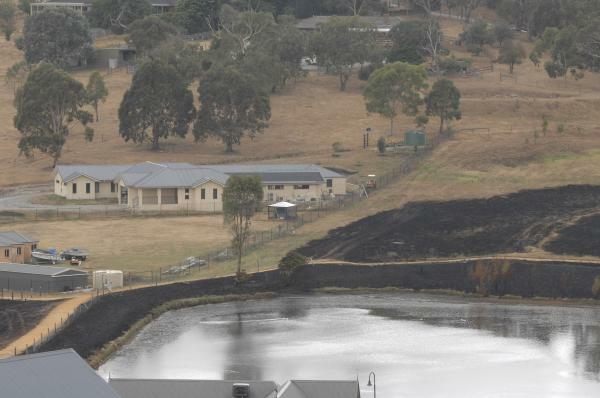 “We were lucky enough to get a water bombing helicopter here as there were so many houses at risk,” she said. “I was not much use fighting the big fire, but I saw so many spot fires starting in people’s gardens, so I grabbed the garden hose and started putting out the spot fires. Claire, along with two of her neighbours, climbed a fence to put out a vegie patch on a property two doors down from them. “It was well lit and up against their house wall. We definitely saved that house,” she said. When returning home one time, Claire found her dad collapsed out the front. “He’s went out to water down the garden to prevent spot fires at our place, but passed out from the heat,” Claire said. “I took him inside, popped him in the shower and managed to flag down an ambo as we couldn’t get through to 000. I’m a nurse now, but I wasn’t at the time and I was panicking. By this time, Claire said the fire seemed to be under better control so she stayed home. “We helplessly watched a house on the hill slowly burning. It burned and glowed through the night,” she said. “I cried, a lot. We were exhausted. Steve came home eventually, black and sweaty and muddy. Steve was out fighting the fires for several hours and he was exhausted when he returned home. He remembers the people standing around bewildered, desperately trying to stretch hoses to reach as the water pressure was low. “He remembers saving one particular house, near the lake, with a few other blokes, where a woman was fighting the fire nipping at her house, all alone,” Claire said. “They all saved it together and she was crying and grateful. Days following, Claire remembers everyone being dazed and in disbelief. “We never thought we’d be at risk, considering ourselves suburbia, but I guess as semi-rural, we are at risk, as we found out that day,” she said. “We walked around afterwards, inspecting the damage and path of the fire. Lots of people were doing the same, and everyone was stopping and talking about it.